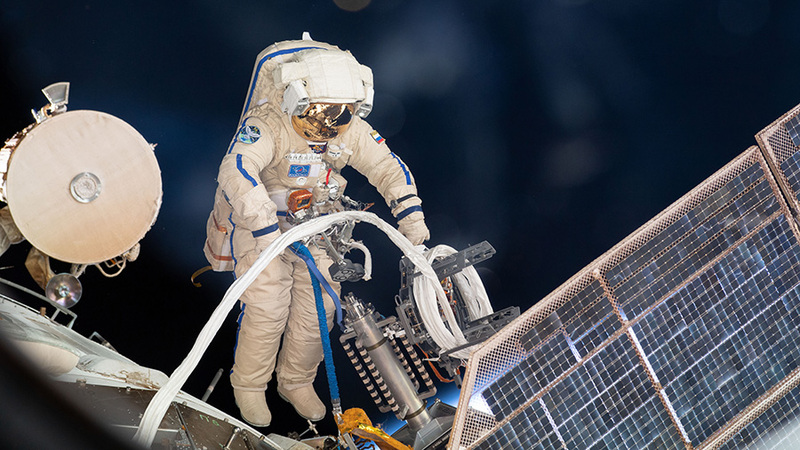 Roscosmos cosmonaut Sergey Prokopyev lays cable for the installation of the Icarus animal-tracking experiment on the Zvezda service module during a spacewalk that lasted seven hours and 46 minutes. The Expedition 56 crew members explored using algorithms to remotely control a robot on the ground and satellites from the International Space Station today. The orbital residents are also cleaning up after a Russian spacewalk while preparing for a pair of upcoming U.S. spacewalks and a Japanese cargo mission. Astronaut Alexander Gerst of the European Space Agency is testing the ability to control a robot on a planetary surface from an orbiting spacecraft. The study seeks to bolster the success and safety of future space missions with astronauts and robots sharing decision-making responsibilities. Commander Drew Feustel joined Flight Engineer Ricky Arnold in the Japanese Kibo lab module monitoring a pair of tiny internal satellites, also known as SPHERES. They are evaluating an algorithm that controls the operation of the SPHERES in formation using six degrees of freedom. Cosmonauts Oleg Artemyev and Sergey Prokopyev are cleaning up after Wednesday’s spacewalk enabling new science outside of the space station. The two dried out their Russian Orlan spacesuits and water feed lines then began stowing spacewalk tools and gear. At the end of the day, Gerst started charging U.S. spacesuit batteries ahead of two maintenance spacewalks planned for Sept. 20 and 26. Gerst and fellow spacewalkers Feustel and Arnold will replace batteries on the Port 4 truss structure’s power channels. The Japanese “Kounotori” HTV-7 cargo ship is targeted to deliver the new batteries ahead of the two spacewalks on Sept. 14.